Even if you only started sewing, I am sure you have collected many paper patterns, pattern pdfs, patterns for your quilting and/or embroidery software. And if you haven’t – you soon will! 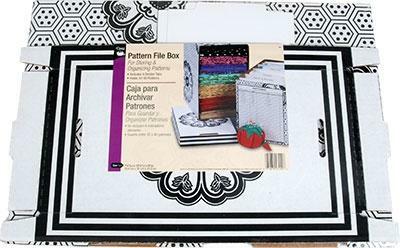 There are boxes made especially for patterns that look like this and available here: Pattern File Box by Dritz. The negative of these boxes are that they are not sized for the larger (think Vogue) patterns. 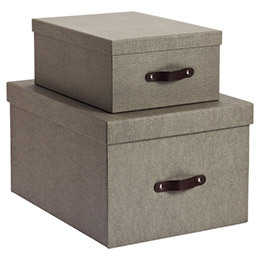 A clever solution is to use a decorator type box, like these Marten storage boxes from container store, that can store patterns of any size and they can be displayed as decor. Its storage but doesn’t look like storage. Nisha uses these boxes for her notions as well. Each notion is in a small plastic container that has the name of the notion on it. That way they are very easy to find. They are in assorted sizes and I configured them to fit the size of the martin box exactly. She has limited space, so these boxes add to her living room decor. Our sewists tend to organize their paper patterns in one of two ways – Either by brand and then by number, or by garment type (pants, skirt, jacket). They tend to file the pattern based on the one garment they purchased the pattern to construct. Some remove the actual tissues, and store the jackets separately in binders or file folders. Regardless, the goal is to both store the patterns and to make them easily searchable when we are planning our projects. And of course to be able to find them once we want to use them. Here is a technology solution for the searchable step- using Evernote and the Fujitsu SnapScan. I am in love with Evernote, when I discovered it’s power in organizing my sewing world. I tested lots of entry methods and found the ideal one for me. For me, the power of Evernote is the thumbnail picture that is available on my mobile devices. I wanted to see both the front image and the back yardage of a paper pattern. I remove the tissue, so I am only scanning the envelope. Then using the carrier, launch the scanner from my Windows PC. The image uses the “scan to folder” feature which works like this: Evernote looks in a folder you have specified for files and then moves them into new note in an Evernote folder you have specified. Pretty slick because you don’t even need to save the file on your local pc. Once I have done a couple (or how ever many I purchased on sale!) I go into Evernote and add a title to the note, I use the manufacturer name and number, I also add the copyright date. Because I use the paid version of Evernote every single word on the pattern envelope becomes searchable! And I can see the image and yardage info on my phone as thumbnails no downloading of the entire pdf required. I have also decided to add the copy write date, so I know if the pattern is truly vintage or a modern reprint. And also because what is the definition of vintage anyway? Geeky stuff on actually how to configure this follows – skip this if your eyes are already glazed over! I created a folder “Patterns”. I configured a custom profile of the Fujitsu SnapScan ix500 on my Windows PC. My profile happens to be called patterns but any name works fine. Under the scan button settings, the application is scan to folder, save is a windows file folder I call patterns. Example C:\Users\Markita\evernote\patterns. Scanning options choose Duplex (Double sided) and blank page removal. File options choose PDF and check convert to searchable PDF. everything else is default. A tiny bit of clean up is required, haven’t figured a workaround for it yet. SnapScan creates 2 files in this process – the pdf and a .ini file. I simply delete the .ini files in Evernote, yes an extra step but a small one. All of those downloadable pdf patterns, embroidery designs, Electric Quilt Designs – just put them in a note as well. A final thought on patterns. Many times we want to preserve the actual pattern. So we use some sort of paper to create our custom modifications. Our sewists have used the following products. Swedish tracing paper, medical or nail supply rolls of paper, Palmer Pletsch makes a paper with grids called Perfect Pattern Paper, but here is one you probably haven’t heard of Geopaper. It is designed for plumbing, but is very transparent and one roll should last a very long time! Great idea! I didn’t realize the paid version of Evernote let’s you search by each word. That’s very handy in that if you want to search by fabric, it’ll list all the patterns that have that type of fabric on it. Now I’m really tempted to get the paid version of Evernote. I’ve just been using Evernote Web Clipper and pulling the front and back of envelops from the websites. Then I have a stack in Evernote and list each pattern maker and sort into those. This has come in very handy while getting fabric cut and estimating how much I need. I just pull up the pattern on my phone and zoom in. I did purchase those Dritz boxes earlier this week (and a flexible bodkin). Nancy’s notions had ’em 3 for $12. if you purchase the annual subscription bundle a mobile app comes with it.The app syncs with your computer. Previous Previous post: It’s A Sewing Party!! !